Alluxa was founded in California in 2007 by a group of experts with many years of experience in the area of thin-film technology and measurement technologies. It is worth noting that the currently nine (five more will be coming soon) identical coaters were designed and built in house; thus, this team of currently fifty employees can perform at an optimum level that is achieved nowhere else. Each coater covers the entire production process. The combination of modern automation technology and online monitoring, algorithms developed in house, and patented plasma coating processes facilitate individual hard coating processes that allow reproducible results due to full automation. A specially developed series of flat-top ultra-narrow band filters with a FWHM of <1 nm demonstrates excellent transmission/blocking behavior. Typical transmissions lie above 92% in combination with a broadband deep blocking performance of up to OD6. This is all thanks to the monitoring system developed in house for formats of up to 250 mm in diameter, which can be considered to be at the technological forefront. 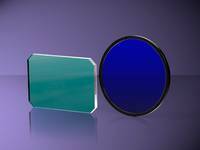 Edge filters, notch filters with broadband transmission and low ripple, dichroic elements (upon request, even available with a planarity of <0.1 waves/1”), multiband filters, and custom job coatings in the UV to the NIR are all an integral part of the spectrum.